1. Measure & cut the twine to desired length. 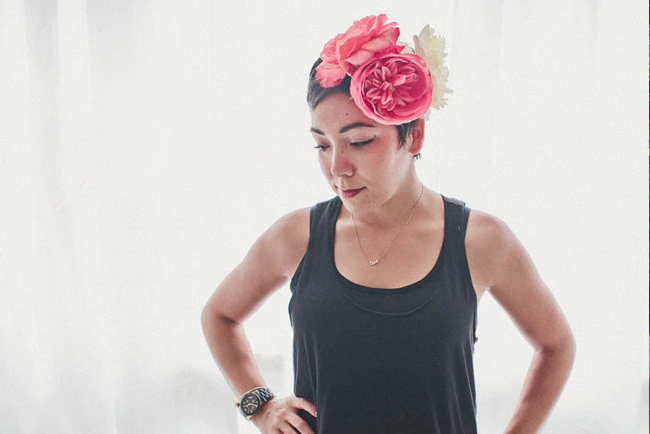 Leave a little extra room, because you can always trim shorter afterwards. 2. Wrap floral wire around twine to make it sturdier. This step can be skipped if using a different material than twine. 3. 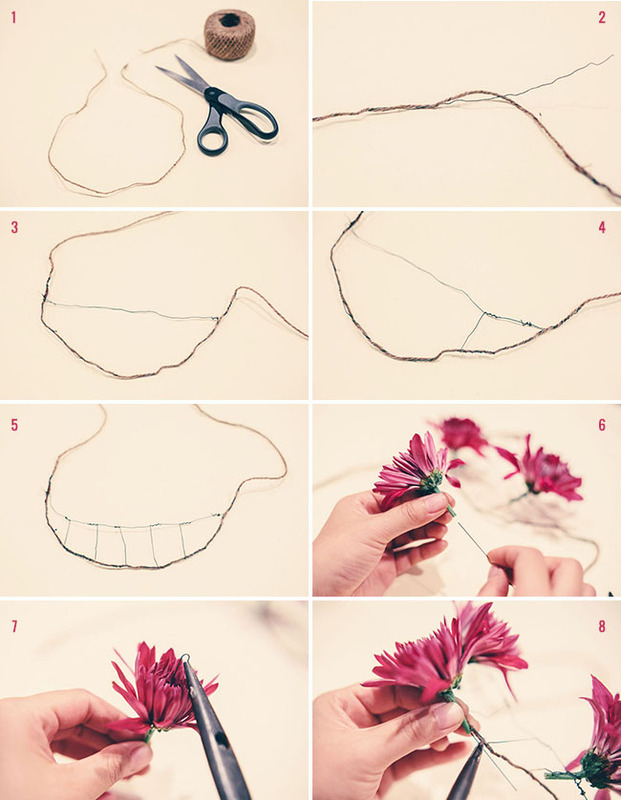 Cut a piece of floral wire and attach to either end of twine to create a “crescent” shape. 4. 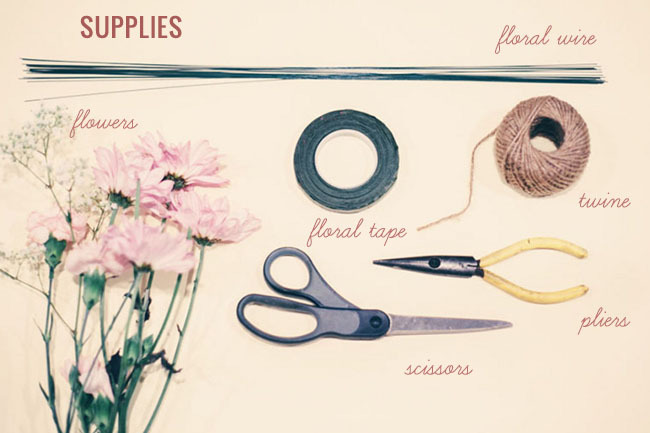 Add floral wire vertically from wire to twine, creating small sections. 5. Continue adding wire across entire necklace. The goal is to create a sturdier structure to attach the flowers to. 6. Cut a flower, cut a piece of wire and thread it through the stem until it pushes through the head. 7. Bend a small hook on the tip of the wire, then pull the wire back down into the flower. 8. 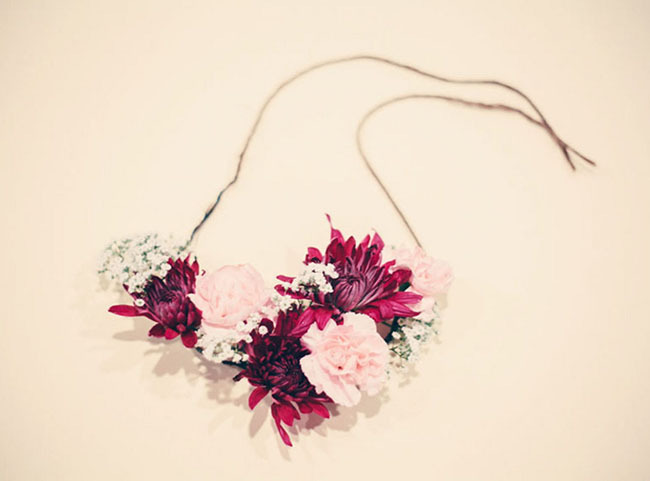 Attach the flower to the necklace by wrapping the wire. Can also used floral tape to hep secure or cover poking wires. Continue adding flowers until necklace is complete. Once done, store in a small tray of water in refrigerator if not using immediately. 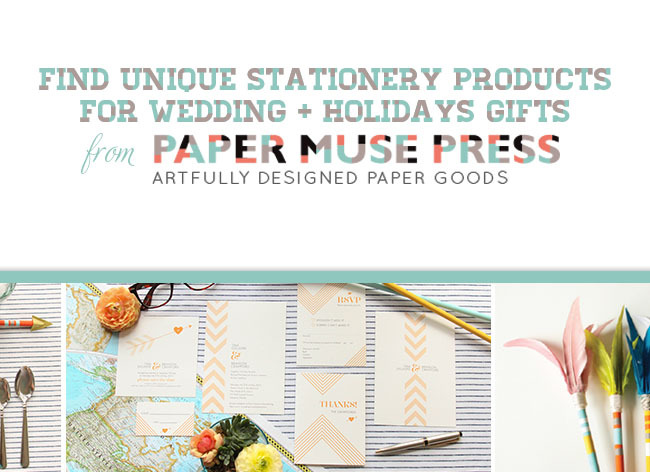 Thanks so much to Jennifer Fujikawa for this lovely DIY! 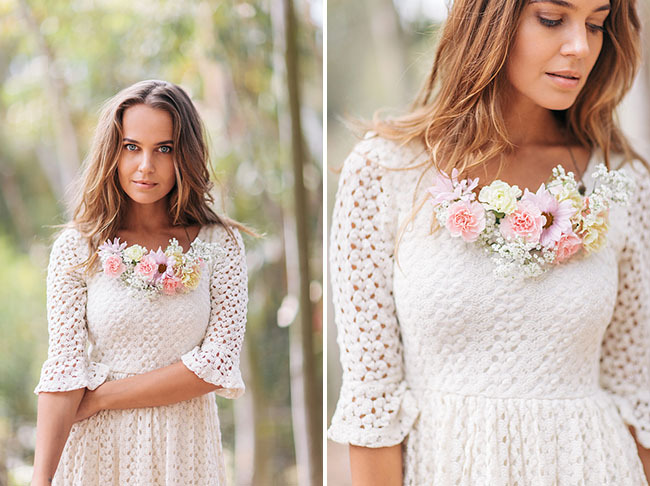 It looks so simple to make but I bet there’s a lot of work behind these wonderful necklaces. 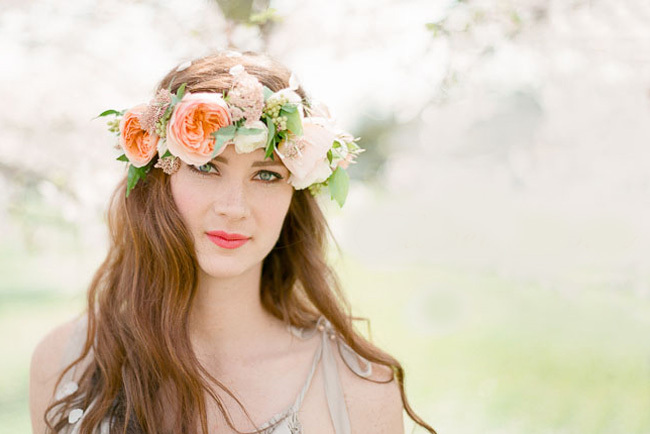 I love this for a wedding! Especially for the bridesmaids. Even easier you could use Oasis cold glue to attach the flowers to the framework.. Just be sure to seal cut stem ends with it. This is so adorable! 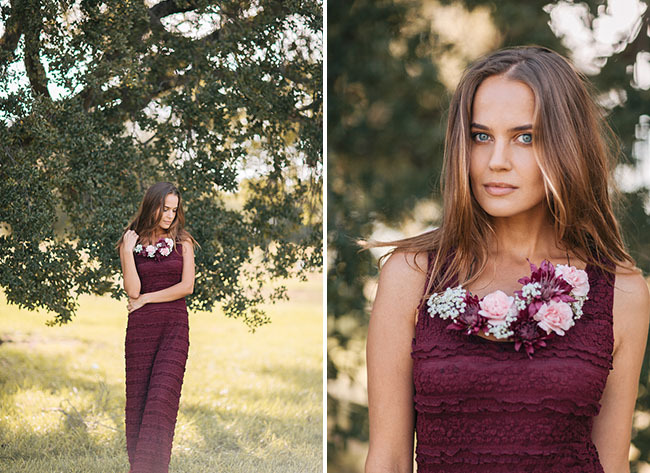 I love that you can mix it up and use colors that complement your dress and skin tone. What a wonderful accessory for a women to wear. Goes with the dress perfectly. 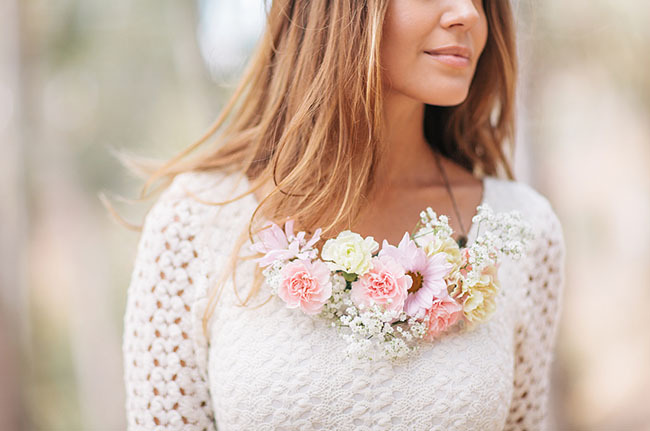 I’m sure floral necklaces will grow in popularity as more designers learn how to make them. Wow! This is amazing. So pretty.